subway | this is what I never expected to do. 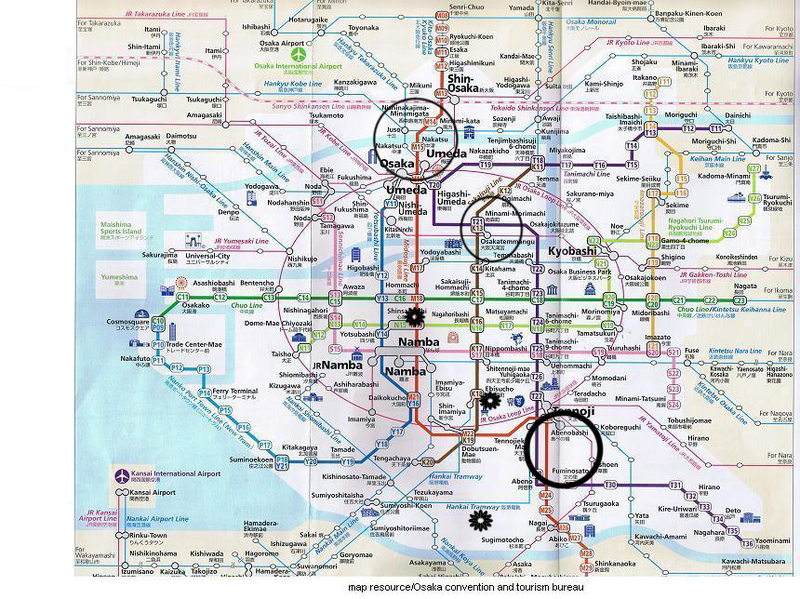 This the Osaka Subway map. The light blue lines are train lines, I think. There are always trams. I’ve just been using the subway. The really bold circle is my neighborhood. Tennoji Station (slightly covered by the circle) is a large station where several lines connect and it is about a fifteen minute walk from my apartment. The uppermost circle is where half of the trainees in my group live, but I haven’t been that north yet. The other circle just below that is where I’ve been commuting for training. It is about a fifteen minute ride from Tennoji. The uppermost little star is where we’ve all gone as a group a few times now, around Shinsaibashi (mentioned in a previous post). Lots of shopping. Lots of restaurants. Lots of people. Lots of lights. A book store that carries English books, a Krispy Kreme, a nice rooftop garden. The middle star is where I wandered to yesterday – Den Den town and some other shopping district. It’s a couple kilometers from my apartment. The lowest star is the neighborhood of two of the other trainees. The subway system is not too difficult to figure out. It is difficult, however, to figure out when it is going to be completely packed. There seem to be multiple rush hours in the morning and evening. Still have not figured it out. And that is where I live. a more thorough explanation of how my first couple days went. If you want the jist of this long post without reading through it, skip to the end for a summary! The plane ride was fine. It was long, but I was able to sleep a reasonable amount. I watched 127 Hours and tried to watch Due Date. I have no idea what time I arrived here as I was far too excited to bother with checking the time. Getting through customs and security was easy. I found the the luggage delivery service and left my two fifty pound bags there. I wanted something cold to drink from the vending machine, but accidentally got a hot tea. The friend that I had made by Saturday afternoon’s update was on the bus with me from the airport to Namba Station, which is maybe in central Osaka… I’m still figuring all that out. The first things I did after getting into my apartment were call home to Mum and Dad, and then buy toilet paper and food. My first meal was some sort of chicken and shrimp with some kind of veggies and rice from a convenience store just a few minutes walk away. I slept well the first night. Saturday morning, I went to have a shower and couldn’t figure out why I wasn’t getting any hot water. I resorted to boiling water on my one burner stove and pouring that into my bathroom sink. It was tricky. After my luggage was delivered, I went out exploring. I found the Ward Office, but it’s closed on the weekends. A McDonald’s is right across the road from there, so I ended up ordering a Teriyaki burger. It was pretty good. I ordered it to go, but then realized once I went outside that people don’t eat outside anywhere, so I wandered back to my apartment and ate here. Found some mail in my mailbox from the company I am working for. That was nice. I like receiving mail. Send me some letters!! Wandered around for a couple hours after that, looking for a LAN cable. Got to use “Ego ga hanasemasu ka?” a lot (“Do you speak any English?”) and “Wakarimasen” (“I don’t understand”). Mostly walked in one direction only, up one street, hoping that I wouldn’t get lost (I didn’t). Eventually found a media cafe, where I now have a membership card for. Found a grocery store and bought some milk (I figured out which one it was because it had a picture of cows on it), strawberry yogurt, and cereal (some sort of whole wheat Frosted Flakes, maybe). As I got comfortable for the rest of the evening in my apartment, sweats on, hair back, bumming around, I got a note in my door mailbox from a guy living a floor below mine saying he also just moved in and that we should go to some gathering together the next morning. I wandered down to say hi and ended up chatting for awhile. My second friend! Well, technically I had met another person just shortly before him when I ventured across the hallway to ask another tenant about this hot water situation. We found a switch on my balcony and that problem was solved. My friend downstairs showed me how to figure out the heater which has been a great delight to know how to use. It gets very cold at night, into the morning. The days are fairly mild. It feels sort of like it might in St. Catharines in April. Today I met 6 other people who will be in my training group. We spent the whole day together wandering around. Went to a store sort of resembling a three-story Target, grabbed lunch, explored. That makes nine of us so far. I think there will be others at the training group from Kyoto and Kobe. I am the only Canadian, and I think I am the youngest of us all. There are four Americans – two of them a couple from Vermont, the other two are a couple of guys both from San Diego who had never met. Two Kiwis. Two guys from England. They are all quite personable. Finally brave the subway today, alongside my friend from downstairs (one of the guys from England). We bought a ticket for the Japanese Railway first by accident, then couldn’t find a ticket machine for the subway, and then finally figured it all out quite successfully. We were very proud of ourselves. Now that we’ve had to do it a couple times, it is not nearly so intimidating as it was initially. In brief: I’ve met a bunch of people, I have hot water, I have a heater, I have Internet at my apartment now, I found a supermarket, I figured out the subway. You are currently browsing entries tagged with subway at this is what I never expected to do. .